The history of the Mu clan is intrinsically linked to that of Lijiang; for one would not exist without the other. 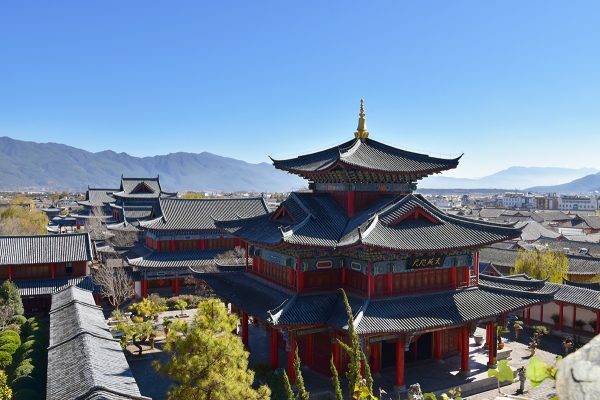 The Mu were a Naxi family who became well-known for their exceptional skill and experience in city planning, and eventually masterminded the construction of Baisha Village and Dayan Town (modern-day Lijiang Old Town). They managed to maintain rule over the area right up until the Yuan Dynasty (1271-1368), when they were overthrown by the Mongolians and reinstated as Tusi. Under their new title, this industrious and talented family led the region into financial prosperity throughout the Yuan, Ming (1368-1644) and Qing (1644-1912) dynasties and their glorious family mansion is a testament to their success. In its heyday, twenty-two generations of the Mu family lived in this mansion. It once covered over 64,000 square metres (16 acres) and consisted of nearly one hundred buildings. Many visitors described it as a miniature Forbidden City because of its beauty and design. Bear in mind comparing any lowly mortal to the deified Emperor was punishable by death, so saying the mansion of an official was reminiscent of the imperial palace was a pretty risky compliment to make! Tragically most of the original mansion was destroyed during the Qing Dynasty due to the frequent wars that broke out around the region but, from 1996 to 1999, it was rebuilt. Nowadays the complex covers half the area it once did, stretching to only about 32,000 square metres (8 acres), but all attempts were made to capture the essence and style of its original magnificence. It stretches up the east side of the Shizi or Lion Mountain in the southwest part of Lijiang Old Town and is made up of two areas; the office area and the living area. As you enter the main gate, you’ll come upon the Yishi or Meeting Hall at the end of a vast courtyard. This marks the beginning of the office area and, as the name suggests, this hall was used to conduct official business and hold meetings. The building itself is surrounded by stunningly carved marble balustrades and on the inside you’ll find three wooden steles that have been engraved by three different Ming Emperors with the words “Devoted to the Country” (诚心报国). With an office this tranquil, it’s no wonder the Mu family were so successful. If only all offices could be like this! Directly behind Yishi Hall, you’ll find the spectacular Wanjuan Pavilion. The word “wanjuan” (万卷) means “ten thousand scrolls” or “ten thousand books” and this pavilion is truly a book lover’s paradise, with thousands of sutras, paintings, and scrolls of calligraphy lining its walls. Parts of this collection are over 2,000 years old and include sacred texts of the Dongba religion, volumes of the Tripitaka, poetry anthologies of six poets from the Mu family, and the calligraphy and paintings of numerous celebrated calligraphers and artists. Behind the pavilion, the mysterious Hufa Hall was once the centre for the family’s religious activities, such as ritual sacrifices and prayers. To the far north of the hall, there’s a vast expanse of courtyards that represent the living area of the Mu clan. These courtyards, and the mansion as a whole, reflect the architectural style of the Ming and Qing dynasties. The layout is incredibly similar to that of the Forbidden City and the simple elegance of the decorations is characteristic of the Central Han Chinese style. The exotic flowers and rare medicinal herbs that bedeck the many courtyards are reminiscent of Suzhou’s royal gardens and the paintings on the inner and outer walls are imbued with ethnic flair from the Bai, Tibetan and Naxi styles. At the top of the complex, there is a Taoist temple where monks still worship and Taoist fortune tellers ply their trade. In a few of the courtyards, visitors can purchase tea, beer or other beverages and settle down to a quiet afternoon spent admiring the many lush azaleas and orchids adorning the gardens. A peaceful evening spent in contemplative thought, sipping on a hot cup of tea and feeling the last warm rays of the sun as it sets over the mountains; I can’t think of a better way to spend a day. Tusi: Chieftains or tribal leaders who were permitted to rule over a certain region and were acknowledged as imperial officials but who ultimately answered to the Emperor. Sutra: One of the sermons of the historical Buddha. Dongba: The main religion of the Naxi ethnic minority. It is most famous for the Dongba script, the last known hieroglyphic writing system still in use. Tripitaka: The collective term for the three main categories of sacred text that make up the Buddhist canon. These are sutras, abhidharma, and vinaya.